On 10 December, International Human Rights day, the representative of the Secretary-General of the United Nations, Martin Kobler, said in a speech during a ceremony hosted by the Ministry of Human Rights in Baghdad, that the word of Prime Minister Nouri al-Maliki on human rights fully reflects the agenda of the United Nations. This opinion however is not shared by the majority of Iraqis and neither by the minorities in Iraq. The national Chaldean movement issued a statement on 14 December asking the United Nations to change Martin Kobler, accusing him of condoning human rights abuses and diminishing the rights of religious minorities, and described him as the “Minister” of the United Nations in the Iraqi government. The above link shows the body of Mohammad Al Qaysee, a member of the Iraqi Red Crescent Organisation. The criminals in the prison’s administration finally released his body. He died under torture 45 days ago but Maliki’s secret prisons staff wouldn’t let his family collect the body because they are expecting a decision from the Iraqi Parliament tot allows them to dump the bodies of such cases because of the financial burden. The deceased has a two-year old daughter, and his mother was threatened to be killed if she released information about his death. While the criminals of the Green Zone Government and Mr Martin Kobler are running a circus show about the Palestinian Prisoners in Israeli Prisons and brag about the so-called “human rights” in Iraq, thousands of Iraqi innocent prisoners are getting tortured and killed because some kind of a sick sectarian Informer accused them of not being as the occupation government would like them to be. It’s not the first time the IRCS is under fire. Here is a 2004 sample of Iraqi IRCS security events in 2004 that are far from the majority of events the organisation has sustained. However, they give an indication of the frequency and the types of security incidents concerning IRCS. – 27 January 2004. IRCS office in Baghdad raided by a gang. – 18 March 2004. IED explodes in front of IRCS Baghdad Office. – 04 April 2004. 2 bodies found dead in the street. They worked together for IRCS. The man was IRCS director in Erbil. – 10 April 2004. Assassination of IRCS director and his wife in Mosul. – 30 August 2004. IRCS convoy was targeted by unknown gunmen in Mahmoudiya, 40 km south of Baghdad, with machine guns and rocket propelled grenades. The truck and the ambulance were burned out. when gunmen in police uniforms kidnapped about 30 people from one of its offices in the central Karrada district in the capital. “We have suspended our operations in Baghdad until all the hostages are released,” Maazen Abdullah, secretary-general of the Iraqi Red Crescent, told Reuters. Gunmen have released 17 hostages, most of them employees, Abdullah said. The ICRC had already pulled its own international staff out of Iraq in 2003, when its offices there were bombed. Officials described how a large convoy of new vehicles similar to those used by the Iraqi police drew up at the Red Crescent office in Baghdad. Men in uniforms similar to those of the Interior Ministry’s special commando forces got out and entered the building, saying they had been sent to check the premises. The interior ministry was quick to declare that none of its units had been on duty in the area at the time. Strangely enough the kidnapping took place 2 days after Dr. Jamal Al-Karbouli, the vice president of the Iraqi Red Crescent Society had told a gathering of reporters, during a United Nations meeting in Geneva, that “the main problem we are facing is the American forces more than the other forces. We are spending a lot of time to explain about the Red Crescent,” he said, according to the Associated Press. The American military, he said, had been consistently using overly aggressive tactics — what he even referred to as “attacks” — in searching the agency’s headquarters for insurgents. But the insurgents themselves had never given the Red Crescent any trouble. The kidnapping was the latest in a long series of similar operations and the second in less than a week. A few days earlier, gunmen in military uniforms kidnapped up to 70 people from a commercial area in the Sanak area of the capital. But there is also a suspicion that the police are so infiltrated by the militias that they are indistinguishable from each other, says the BBC’s Jim Muir in Baghdad. To prove that the US occupation forces were involved, it suffices to consult the DoD website. I will copy in full a very revealing article to prove the involvement of the Occupation Authorities. The operation center will allow police commandos to provide immediate updates to their deployed brigade and battalion headquarters. UNDISCLOSED LOCATION, Iraq, Feb. 11, 2005 — The Iraqi Police Commando Headquarters is now home to a nationwide command, control, communications, computer and intelligence operations center. Satellite phones, communications and Internet satellites, Internet connectivity, and new computers are at the heart of the new center. “The operations center will allow the commandos to obtain instantaneous reports throughout the country and provide a direct link to the Ministry of Interior,” said the commander of operations for the Commandos. The operation center will allow the police commandos to provide immediate updates to their deployed brigade and battalion headquarters, call in immediate support, deliver timely reports, assess supplies and soldier conditions, and deliver limited intelligence. “In Iraq we have a saying – one hand cannot clap. The American and multinational troops give great support to the commandos,” the Iraqi Police Commando liaison officer to the Multinational Security Transition Command-Iraq said. “This is the first Iraqi force created in the organization of the Ministry of Interior to fight the insurgency. The Americans have provided the equipment, supplies, munitions, phones, and training,” he added. In addition to the direct link at the Ministry of Interior National Command Center, the commando operations center will also have direct contact with Multinational Security Transition Command-Iraq forward operating bases to coordinate with multinational troops for future missions. U.S. Air Force Staff Sergeants Rickey Anderson and K. Kapono Bangay worked with local Iraqi contractors to install the satellites, computers and Internet connectivity. “We’re here to assist the Iraqi contractors with the satellite installations and make sure the computers are installed and fully functional for the operations center,” said Sgt. Anderson. U.S. military officials overseeing the project said the cost for this operations center was approximately $50,000 dollar in equipment and connectivity. And here is an excerpt of a Department of Defense Briefing that clearly proves that the US forces were fully in control of the Special Police Commandos, the deadly force that they created, armed, trained and deployed against the whole Iraqi population in resistance. “In terms of your latter question and vigilante action, we feel very secure within the Public Order Division, and I’m — certainly my partner, Jeff Buchanan, and the special police commandos would say the same thing about the fact that we don’t have vigilantes running about without our supervision or without our knowing it. As I said, we’ve got a team with every single battalion. There are no separate company bases that would be perhaps underneath the or outside of our oversight or supervision. We do — we accompany them on all their missions. We also see where those detainees go because we help in the processing and medical screening of every detainee that comes in. So it’d be extremely difficult if — I can’t rule out the possible. It’s nearly impossible to hide that from the Special Police Transition Teams, so I don’t think that that exists within the national police we work with, and we certainly haven’t seen any of it in SPTT. Q Can I follow up? If that’s true, then that would suggest that it’s not going on at all, and in fact bodies are turning up. Are people thinking that the perpetrators of this are posing as special police, that they’ve gotten the uniforms and that are going that way? COL. DAVIS: I’m not sure, Pam, if I can really answer that question because my total focus in life is supporting these — the special police, the national police, so I don’t have — I haven’t run into experience with death squads or vigilante teams. We do know that there are uniforms available from the old regime as well as those purchased by local contractors. So if — that’s a possibility, certainly, but not something that we’ve experienced. Going back to the question of problems, one of the problems we’ve seen in other police units and training units is the infiltration of insurgents within. Have you had any of those kind of problems, and how are you preventing that from occurring in your group, if you have managed to prevent it? COL. DAVIS: Sure. Well, first off, we haven’t found anyone within the public order police who is a — who we considered an enemy or an infiltrated insurgent or terrorist. We have in fact picked out a cadet while he was still down at the training course — because all the names we get for the recruits are vetted through MOI, and so they check their databases, and one was taken out at graduation simply because they identified and cross-checked that name. In terms of other potential insurgents or terrorists within the group, they have very tight operational security measures that they employ which prevents, I would say, the loss of operational security or information getting out. The only conclusion must be that the kidnappers were not “men in uniforms similar to those of the Interior Ministry’s special commando”. The kidnappers actually were Special Police Commando Forces. 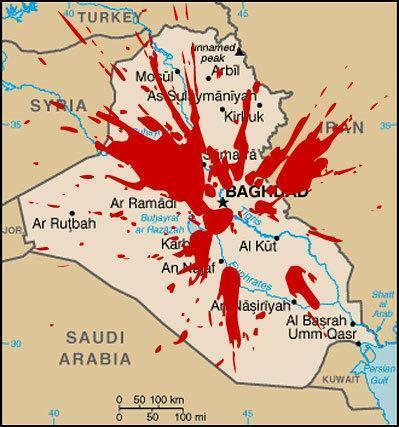 And Maliki has continued the counterinsurgency policy he inherited from his American masters. The assassination is not the only “incident” where the Prime Minister is involved in. Despite overwhelming evidence of US involvement in the death squad activities, the mainstream media has indeed misled the people since 2003 into believing that the Iraqis themselves were responsible for the hundreds of thousands senseless killings of fellow countrymen. It’s time for the truth. It’s our duty to expose ALL the war crimes committed during this illegal imperial war. Our countries were involved. Its our responsibility to demand accountability and justice for Iraq. Let me conclude with the words David Edwards wrote on 12 December on the Medialens website.